Max Beats Gummies + Pills! We use wild-caught, deep water fish, in its natural triglyceride form, certified sustainable by Friends of the Sea. The smooth and delicious zesty orange flavor is easy to digest - which mean no fish burps! Our fish oils meets or exceed all government + international standards for purity and safety. 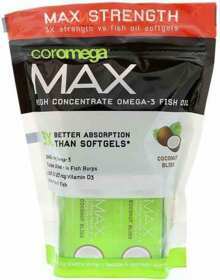 Unlike softgels, our multi-layer pouch keeps out sunlight and oxygen for better efficacy and freshness.